^ 1.0 1.1 （英文） Metcalf, S.J., Vaughan, R.F., Benton, M.J., Cole, J., Simms, M.J. and Dartnall, D.L. A new Bathonian (Middle Jurassic) microvertebrate site, within the Chipping Norton Limestone Formation at Hornsleaslow Quarry, Gloucestershire. Proceedings of the Geologists’ Association. 1992, 103: 321–342. ^ （英文）Case, J.A., Martin, J.E., and Reguero, M. (2007). "A dromaeosaur from the Maastrichtian of James Ross Island and the Late Cretaceous Antarctic dinosaur fauna." Pp. 1-4 in Cooper, A., Raymond, C., and Team, I.E. (eds. ), Antarctica: a Keystone in a Changing World -- Online Proceedings for the Tenth International Symposium on Antarctic Earth Sciences, U.S. Geological Survey Open-File Report 2007-1047, SRP 083. U.S. Geological Survey, Washington, D.C.
^ 4.0 4.1 4.2 （英文） Ostrom, J. H. Osteology of Deinonychus antirrhopus, an unusual theropod from the Lower Cretaceous of Montana (PDF). Peabody Museum of Natural History Bulletin. 1969, 30: 1–165. ^ （英文）Paul, Gregory S. (2006) "Drawing Dinosaurs"(2006). "Geotimes", January 2006. 存档副本. [2007-12-18]. （原始内容存档于2008-05-02）. ^ （英文） Makovicky, Peter J.; Apesteguía, Sebastián; Agnolín, Federico L. The earliest dromaeosaurid theropod from South America. Nature. 2005, 437 (7061): 1007–1011. Bibcode:2005Natur.437.1007M. PMID 16222297. doi:10.1038/nature03996. ^ 8.0 8.1 8.2 （英文） Hwang, S.H. ; Norell, M.A. ; Ji, Q.; Gao, K. New Specimens of Microraptor zhaoianus (Theropoda: Dromaeosauridae) from Northeastern China. American Museum Novitates. 2002, (3381): 44pp. hdl:2246/2870. ^ （英文） Perle, A.; Norell, M.A. ; Clark, J. A new maniraptoran theropod – Achillobator giganticus (Dromaeosauridae) – from the Upper Cretaceous of Burkhant, Mongolia. Contributions of the Mongolian-American Paleontological Project. 1999, 101: 1–105. ^ （英文） Britt; Chure; Stadtman; Madsen; Scheetz; Burge. New osteological data and the affinities of Utahraptor from the Cedar Mountain Fm. (Early Cretaceous) of Utah. Journal of Vertebrate Paleontology. 2001, 21 (3): 36A. doi:10.1080/02724634.2001.10010852. ^ （英文）Naish, D. Hutt, and Martill, D.M. (2001). "Saurischian dinosaurs: theropods." in Martill, D.M. and Naish, D. (eds). Dinosaurs of the Isle of Wight. The Palaeontological Association, Field Guides to Fossils. 10, 242–309. ^ 14.00 14.01 14.02 14.03 14.04 14.05 14.06 14.07 14.08 14.09 14.10 （英文） Longrich, N.R. ; Currie, P.J. A microraptorine (Dinosauria–Dromaeosauridae) from the Late Cretaceous of North America. PNAS. 2009, 106 (13): 5002–7. Bibcode:2009PNAS..106.5002L. PMC 2664043. PMID 19289829. doi:10.1073/pnas.0811664106. ^ 17.0 17.1 （英文） Chatterjee, S.; Templin, R.J. Biplane wing planform and flight performance of the feathered dinosaur Microraptor gui (PDF). Proceedings of the National Academy of Sciences. 2007, 104 (5): 1576–1580. Bibcode:2007PNAS..104.1576C. PMC 1780066. PMID 17242354. doi:10.1073/pnas.0609975104. ^ （英文）Ji, Q., Norell, M. A., Gao, K-Q., Ji, S.-A., Ren, D. (2001). "The distribution of integumentary structures in a feathered dinosaur." Nature, 410(6832): 1084 - 1088. ^ 19.0 19.1 （英文） Xu, X., Wang, X.-L., and Wu, X.-C. A dromaeosaurid dinosaur with a filamentous integument from the Yixian Formation of China. Nature. 1999, 401: 262–266. doi:10.1038/45769. ^ 20.0 20.1 20.2 20.3 （英文）Xing, X., Zhou, Z., Wang, X., Kuang, X., Zhang, F., and Du, X. (2003). "Four-winged dinosaurs from China." Nature, 421: 335–340. ^ 22.0 22.1 22.2 （英文）Paul, Gregory S. (2002). Dinosaurs of the Air: The Evolution and Loss of Flight in Dinosaurs and Birds. Baltimore: Johns Hopkins University Press. 472 pp. ^ （英文） Prum, R.; Brush, A.H. The evolutionary origin and diversification of feathers. The Quarterly Review of Biology. 2002, 77 (3): 261–295. PMID 12365352. doi:10.1086/341993. ^ （英文）Norell, M. Clark, J.M., Makovicky, P.J. (2001). "Phylogenetic relationships among coelurosaurian theropods." New Perspectives on the Origin and Evolution of Birds: Proceedings of the International Symposium in Honor of John H. Ostrom, Yale Peabody Museum: 49-67. ^ 26.0 26.1 26.2 （英文） Senter, Phil; Barsbold, R.; Britt, Brooks B.; Burnham, David B. Systematics and evolution of Dromaeosauridae (Dinosauria, Theropoda). Bulletin of the Gunma Museum of Natural History. 2004, 8: 1–20. ^ （英文） Padian, Kevin; Dial, Kenneth P. Origin of flight: Could 'four-winged' dinosaurs fly?. Nature. 2005, 438 (7066): E3; discussion E3–4. Bibcode:2005Natur.438E...3P. PMID 16292258. doi:10.1038/nature04354. ^ 30.0 30.1 （英文）Paul, Gregory S. (1988). Predatory Dinosaurs of the World. New York: Simon and Schuster. 464 pp. ^ 31.0 31.1 （英文）Czerkas, S.A., Zhang, D., Li, J., and Li, Y. (2002). "Flying Dromaeosaurs", in Czerkas, S.J. (ed. ): Feathered Dinosaurs and the Origin of Flight: The Dinosaur Museum Journal 1. Blanding: The Dinosaur Museum, 16-26. ^ （英文） Martin, L.D. A basal archosaurian origin for birds (PDF). Acta Geologica Sinica. 2004, 50 (6): 978–990. 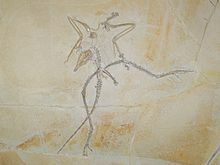 ^ （英文）National Geographic News- Earliest Bird Had Feet Like Dinosaur, Fossil Shows - Nicholas Bakalar, December 1, 2005, Page 2. Retrieved 2006-10-18. ^ （英文） Manning, P.L., Payne, D., Pennicott, J., Barrett, P.M., and Ennos, R.A. Dinosaur killer claws or climbing crampons?. Biology Letters. 2005, 2: 110–112. doi:10.1098/rsbl.2005.0395. （原始内容存档于2012-01-23）. ^ 40.0 40.1 （英文） Davies, S. J. J. F. Ratites and Tinamous. New York: Oxford University Press. 2002. ISBN 0-19-854996-2. ^ （英文） Gilliard, E. T. Living birds of the world. Garden City, NY: Doubleday. 1958. ^ （英文） Kofron, Christopher P. Attacks to humans and domestic animals by the southern cassowary (Casuarius casuarius johnsonii) in Queensland, Australia. Journal of Zoology. 1999, 249 (4): 375–381. doi:10.1111/j.1469-7998.1999.tb01206.x. ^ （英文） Kofron, Christopher P. Case histories of attacks by the southern cassowary in Queensland. Memoirs of the Queensland Museum. 2003, 49 (1): 335–338. ^ （英文） Redford, Kent H.; Peters, Gustav. Notes on the biology and song of the red-legged seriema (cariama cristata). Journal of Field Ornithology. 1986, 57 (4): 261–269. JSTOR 4513154. ^ （英文） Velociraptor's 'killing' claws were for climbing. New Scientist. September 2009, (2725) [2009-09-15]. ^ （英文） Senter, P. Pedal function in deinonychosaurs (Dinosauria: Theropoda): a comparative study. Bulletin of the Gunma Museum of Natural History. 2009, 13: 1–14. ^ 48.0 48.1 48.2 48.3 （英文） Fowler, D.W., Freedman, E.A., Scannella, J.B., Kambic, R.E. The Predatory Ecology of Deinonychus and the Origin of Flapping in Birds. PLoS ONE. 2011, 6 (12): e28964. doi:10.1371/journal.pone.0028964. ^ 53.0 53.1 （英文）Norell, M.A., Clark, J.M., Turner, A.H., Makovicky, P.J., Barsbold, R., and Rowe, T. (2006). "A new dromaeosaurid theropod from Ukhaa Tolgod (Omnogov, Mongolia)." American Museum Novitates, 3545: 1-51. ^ （英文） Forster, Catherine A.; Sampson, Scott D.; Chiappe, Luis M. & Krause, David W. The Theropod Ancestry of Birds: New Evidence from the Late Cretaceous of Madagascar. Science. 1998a, (5358): pp. 1915–1919. 引文使用过时参数coauthors (帮助) 引文格式1维护：冗余文本 (link) doi:10.1126/science.279.5358.1915. (HTML abstract). ^ （英文） Chiappe, L.M. Glorified Dinosaurs: The Origin and Early Evolution of Birds. Sydney: UNSW Press. ^ （英文） Schmitz, L.; Motani, R. Nocturnality in Dinosaurs Inferred from Scleral Ring and Orbit Morphology. Science. 2011, 332 (6030): 705–8. Bibcode:2011Sci...332..705S. PMID 21493820. doi:10.1126/science.1200043. ^ （英文） Zelenitsky, D.K. ; Therrien, F.; Kobayashi, Y. Olfactory acuity in theropods: palaeobiological and evolutionary implications. Proceedings of the Royal Society B. 2009, 276 (1657): 667–673. PMC 2660930. PMID 18957367. doi:10.1098/rspb.2008.1075. ^ （英文） Zelenitsky, D.K. ; Therrien, F.; Ridgely, R.C. ; McGee, A.R. ; Witmer, L.M. Evolution of olfaction in non-avian theropod dinosaurs and birds. Proceedings of the Royal Society B. 2011,. in press (1725): 3625. doi:10.1098/rspb.2011.0238. ^ 62.0 62.1 （英文） Matthew, W. D.; Brown, B. The family Deinodontidae, with notice of a new genus from the Cretaceous of Alberta. Bulletin of the American Museum of Natural History. 1922, 46: 367–385. hdl:2246/1300. ^ （葡萄牙文） Agnolin, F.L. ; Novas, F.E. Unenlagiid theropods: are they members of the Dromaeosauridae (Theropoda, Maniraptora)? (PDF). Anais da Academia Brasileira de Ciências. 2011, 83: 117–162 [2011-04-23]. doi:10.1590/S0001-37652011000100008. ^ 64.0 64.1 64.2 （英文） Sereno, P. C. The logical basis of phylogenetic taxonomy. Systematic Biology. 2005, 51: 1–25. ^ （英文）Novas and Agnolin, (2004). "Unquillosaurus ceibalii Powell, a giant maniraptoran (Dinosauria, Theropoda) from the Late Cretaceous of Argentina." Rev. Mus. Argentino Cienc. Nat., n.s. 6(1): 61-66. ^ （英文） Senter P., Kirkland J.I., DeBlieux D.D., Madsen S., Toth N. New Dromaeosaurids (Dinosauria: Theropoda) from the Lower Cretaceous of Utah, and the Evolution of the Dromaeosaurid Tail. PLoS ONE. 2012, 7 (5): e36790. doi:10.1371/journal.pone.0036790.